Location: Crystal Lake Recreation Area, in the Angeles National Forest. From I-210 in Azusa, take the Highway 39 (Azusa Ave.) exit. Go north on Highway 39, which becomes San Gabriel Canyon Road, for a total of 24 miles. Turn right on Crystal Lake Road and drive two miles to the visitor center. Turn right and park in the day use parking lot, just past the parking lot for the cafe, by the restrooms. A National Forest Service adventure pass ($5 per day or $30 for the year) is required for parking. Click here to purchase. Mt. 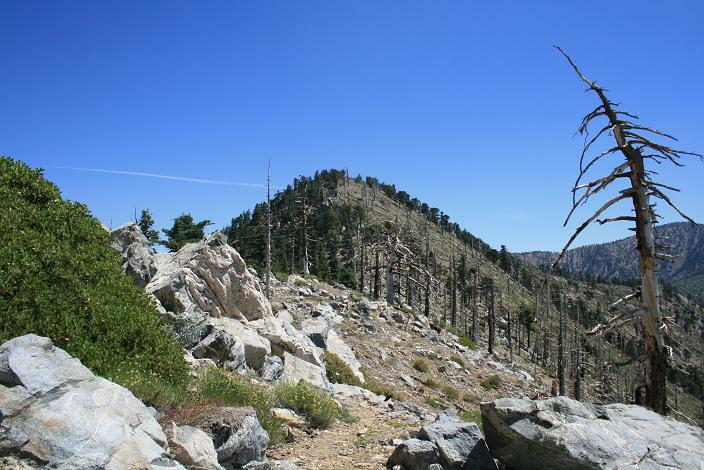 Islip (elevation 8,250) can be approached either from the north via the Angeles Crest Highway or, as described here, from the Crystal Lake Campground. In addition to being a challenging hike, the approach from the south – using the Windy Gap, Big Cienega and Islip Ridge Trails – is very scenic. 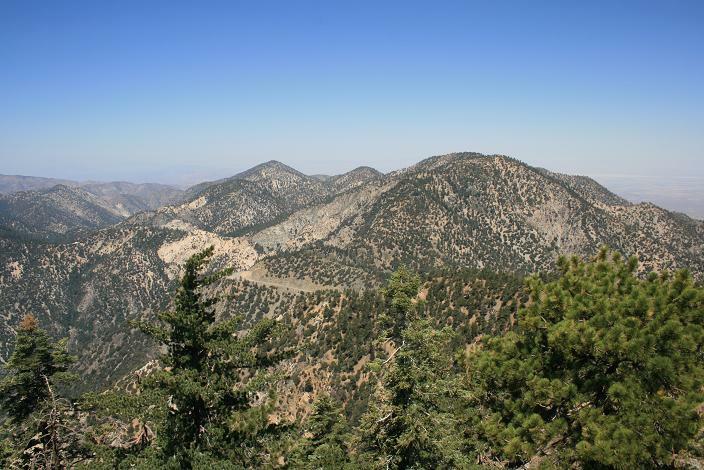 Great views of San Gabriel Canyon, the western Angeles National Forest and the high desert are some of the highlights. While the views aren’t quite as dramatic as on nearby Mt. Williamson, Mt. Islip has to be considered one of the essential hikes of the San Gabriels. The mountain’s name is pronounced “eye-slip”, which hopefully you will not do on the trails that cling to the side of the ridge, dropping off sharply. As of this writing, the road is closed at the visitor’s center, meaning that hikers must park there and walk 0.4 miles each way to the beginning of the Windy Ridge Trail. If the gate past the visitor center is open, you can cut that distance off your hike. Follow the main road from the visitor center, passing by several loops of camp sites, and look for the Windy Ridge trail, heading off to the left. You follow it 0.4 miles through a pleasant forest of oaks and pines, and cross the road again. Continuing your ascent, you reach another intersection, with the Mt. Hawkins Truck Trail. Shortly after this junction, you’ll come to a split. Head left on the Big Cienega Trail. (This trail is more moderately graded, and has more shade, than the Windy Ridge Trail, making it a preferable choice for the ascent.) You head west, enjoying nice views of the canyon below. While the area is still showing signs of damage from the Curve Fire, there are a few trees to provide shade, particularly near the crossing of the upper end of Cedar Creek. After 1.8 miles on the trail (3 miles from the beginning of the Windy Gap Trail), you meet the Islip Ridge Trail. Head right (northeast), getting a look at the round summit in front of you. If you look closely, you can see the Windy Gap trail cut into the slope opposite. You also can see the Angeles Crest Highway and the roadbed of old Highway 39 off to the west. Farther off, you can see Mt. Wilson. After about a mile on the Islip Ridge Trail, head left on a spur signed for the summit. A couple of switchbacks brings you to the top of Mt. Islip, where the ruins of a stone cabin stands. You can also see the foundation of a lookout tower that stood here until 1937. The view from the top includes a bit of Mt. Baldy to the east, Old Saddleback southeast, the San Gabriel Valley to the south, the front country of the Angeles National Forest to the west and the high desert to the north. If you look closely, you can see tiny Crystal Lake in the pines to the south, as well as the Morris Reservoir. After enjoying the panorama, retrace your steps back to the Islip Ridge Trail. Continue heading east (left), through a pleasant grove of pines on the north side of the ridge. In less than a mile, head right at a junction, which soon brings you to Windy Gap. At this four-way junction, head right on the Windy Gap Trail (the Pacific Crest Trail leads straight ahead and to the left). The Windy Gap Trail heads expeditiously downhill, taking in some nice views of Islip along the way. At 1.3 miles below Windy Gap, you meet the Big Cienega Trail, completing the loop. Retrace your steps on the last mile-plus of the Windy Gap Trail, returning to the visitor center.